BackStaff have different ways of sharing information. In this post, we will show you how to send a dynamic message automatically to a group of users each time a new alarm changes state. The name of this application is alarms notification. This example is going to be developed specifically for Inductive Automation’s Ignition software. Nonetheless, it is adaptable to other similar software. The implementation can be done at a tag level, directly from the source of the alarm, or taking the information from the alarm database. Here we will show you both ways. From the figure you can see that the ID has a value of 53. The second step consists of creating a group of users in BackStaff. BackStaff sends the notification to this group. 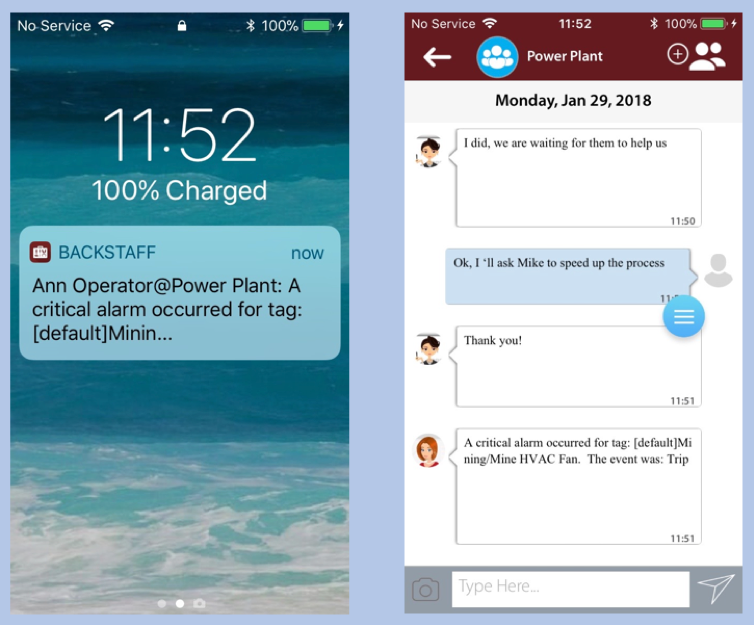 For this example, we make a group called “Power Plant” by employing a user that is not an administrator, and we look for its ID through the query. The third step has to do with including the user anoperator into the group “Power Plant” by using the apps for smartphones or through the WEB app. 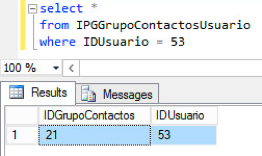 Through the next query, we can verify that the user is within the group. The group type is “1” for the groups created by regular users. This information is in the table IPGTipoGrupoUsuario. What is missing is the definition for the message and the way of calling the stored procedure. In the following two sections we explain how to do this. If you wish to send notifications upon a particular tag event, you can use a function we created for the notifications sending that has the name sendNotification within the Gateway scripts library called BackStaff. 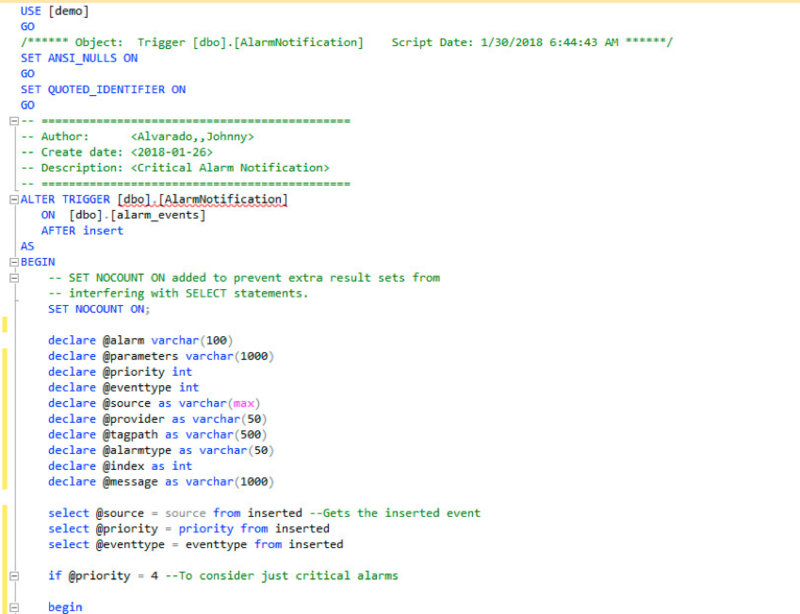 The script events “Alarm Active” and “Alarm Cleared” use this function for the tag you want to link to the notification, and you have to format the message as you require it. An example of the result of the execution of this code snippet is in the following figure. A more general method for sending alarm notifications consists of creating a trigger associated with the insertion of new records in the alarm database. This permits, for example, to choose the critical alarms that belong to a particular area for notification. This method eases the code maintenance a lot. Alarm notification sending from Ignition can be configured from the tags that generate the alarms or from the database where they are stored. In both cases, the procedure to do it is short, simple, and flexible.